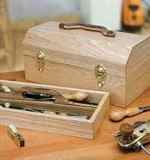 Store chisels, marking tools or whatever you like in this portable organizer. Our stylish ash tool carrier is handsome enough for your home but tough enough to hold its own in your workshop. Learn how to cut quicker corners with a single-setup dovetailed rabbet. Ash construction for toughness and long life. Dovetail rabbet joints create strong corner joints. Simple yet practical design allows plenty of storage options. Maritime Bar Stool and Table Combo Full Size Woodworking Plans.